Many small businesses spend hours designing the perfect email stationery. From the choice of font, to the text, to the logos and awards arrayed under the email body, it is possible to spend days creating an eye-catching layout. But it doesn’t finish there. They then write up instructions for the rest of their employees, about how to customise the signature and add it to their outgoing emails. Depending on how technically gifted your workers are, this process may take quite some time – especially if they make a mistake. The reality is that all the time spent on arty-farty email signatures is completely wasted. Anything that distracts attention from your core business operations, and which does not add anything your customers’ experience is, by definition, a waste of time and money. Heavily designed email signatures tend to be nothing more than a vanity project – your customers simply do not care. If you want to brag about your latest award win, do it somewhere people will notice – on your company's blog. Most people now read email on their mobile devices (56%) – and they don’t want to spend ages scrolling past many logos and banners that add nothing to your message. If you want people to pay attention to what you are saying, don’t make their life harder. It is almost guaranteed that your recipients never see your email signature artwork. Almost every email client ‘clips’ your messages, so the signature is hidden from view to help readers easily track an email thread. And ever since Outlook 2000 was released, Microsoft email clients have prevented the automatic download of images to protect against email malware. 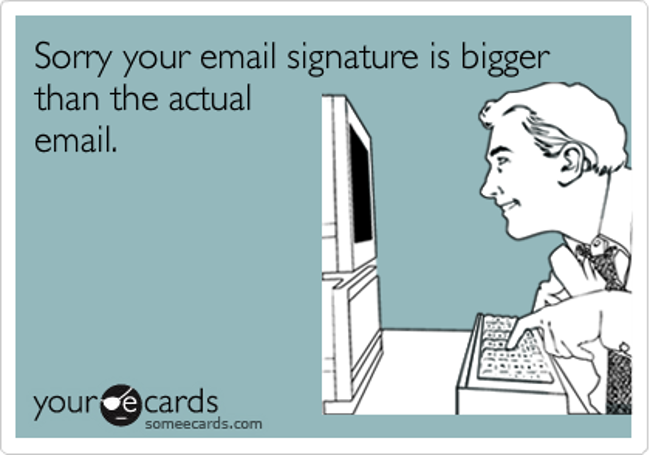 Your recipients have to click another button to see your signature – so why would they bother? The only way to make sure that clients see your signature is through the use of simple, plain text. A text signature communicates important information quickly (your contact details) and gets through every content filter and clipping mechanism, ensuring people see it. Setting up the signature is also extremely easy. Create a template in Google Docs, share it with your workers (in view only mode), and they can quickly and easily copy and paste the layout and update with their own personal information – which means no more messing around with image alignment and funky fonts. More importantly still, the time and effort saved in creating a plain text mail signature can be put to good use, serving your customers and doing “proper” online marketing.